Hello, my name is Shad Leeder. I would like to share with you a brief history of Leeder Hunting. 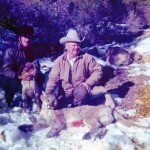 In 1973 Charley Leeder began guiding hunters for mountain lion and mule deer near our home in Kanarraville, Utah. 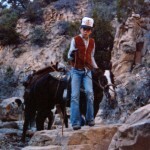 I was five years old at the time and wanted desperately to be big enough to go hunting with my dad. 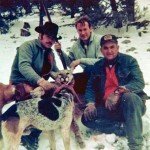 These were great times and the hunting was very successful. I remember waiting impatiently for dad to get home so I could hear about the days hunt and see the results. As the years went by, I did not miss one opportunity to hunt with my dad. 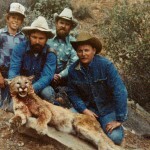 I was able to help dad with the mountain lion hunts every weekend and during the summer break from school. During the fall deer hunts my attendance at school was less than perfect. In those days, business was conducted on a handshake. There were no contracts to sign or liability insurance to worry about. Hunting licenses and tags were available over the counter and we never imagined there would be a lottery system for hunting permits. 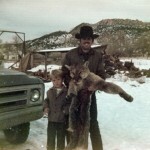 The hunting was great and my dad was very dedicated to his business. I recall very few days that dad was not hunting, either guiding hunters or preparing for the next hunt. 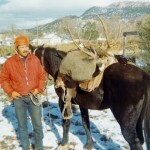 By the late 1970′s Charley Leeder had built a reputation of being a very successful guide and outfitter. The foundation for Leeder Hunting was set and we were very hopeful for our future. 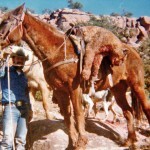 Since 1973 guiding hunters in Utah and Nevada has been our life and our livelihood. We take our client’s success very seriously. 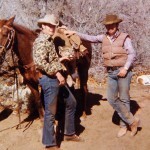 I have included some photos of our hunts in the 1970′s. No apologies for claims that are superlative are necessary for Charlie and his outfit. 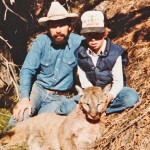 If memory serves me correctly, I was the first Eastern longbowhunter that Charlie ever took out for a lion hunt. The story of which even made the first page of the 1980 SCI big game annual. Since then I have probably sent more hunters to Charlie from the New York City area than anyone else combined and for one good reason, he was and still is simply the best at what he does all the time that he does it. And now to see his son Shad take on such a huge stake in the business just makes me as proud of that young man as I could possibly be. If I would be allowed just one more lion hunt for the rest of my life, it would be with Charlie and Shad in the company of my very dear friend, world famous taxidermist and sculptor Benny Ipolitto, the modern day Sasha Siemel. Thanks for the memories Charlie and Shad!